A couple of sugars, a dash of enzymes, a pinch of salt, a splash of polyethylene glycol, carefully arranged in watery baths. And researchers had made a synthetic organelle, which they used in a new study to explore some odd cellular biochemistry. The researchers at the Georgia Institute of Technology made the chemical medley in the lab to closely mimic membraneless organelles, mini-organs in cells that are not contained in a membrane but exist as pools of watery solutions. And their model demonstrated how, with just a few ingredients, the organelles could carry out fine-tuned biological processes. The researchers published the results of their study in the journal ACS Applied Materials & Interfaces for the September 26, 2018 issue. The research was funded by the National Institutes of Health's National Institute of General Medical Science and by the National Science Foundation. A quick look at membraneless organelles should aid in understanding the research's significance. The discovery of organelles that are pools of watery solutions and not objects with membranes is fairly recent. A prime example is the nucleolus. It resides inside of the cell's nucleus, which is an organelle that does have a membrane. "After cell division, the nucleolus comes back together as a single compartment of fluid," said Shuichi Takayama, the study's principal investigator and a professor in the Wallace E. Coulter Department of Biomedical Engineering at Georgia Tech and Emory University. Instead, they phase separate the way oil and water do, even after intermingling. But there's no oil in this case. "They're all waters," Takayama said. "They just don't mix with each other because they have different solutes." During intermingling, important things happen. The nucleolus, for example, is vital to DNA transcription. But the synthetic set-up, a collection of watery solutions made by the study's first author, Taisuke Kojima, carried out a simpler series of reactions that demonstrated how the membraneless organelles could drive sugar processing. "We had three phases of solutions that each held different reactants," Kojima said. "It was like a ball with three layers: an outer solution, an intermediate solution, and a core solution. Glucose was in the outer layer; an enzyme, glucose oxidase, was in the second layer, and horseradish peroxidase was in the core along with a colorimetric substrate that gave us a visible signal when the last reaction we were looking for occurred." The glucose in the outer layer interfaced with the glucose oxidase in the second layer, which catalyzed the glucose to hydrogen peroxide. 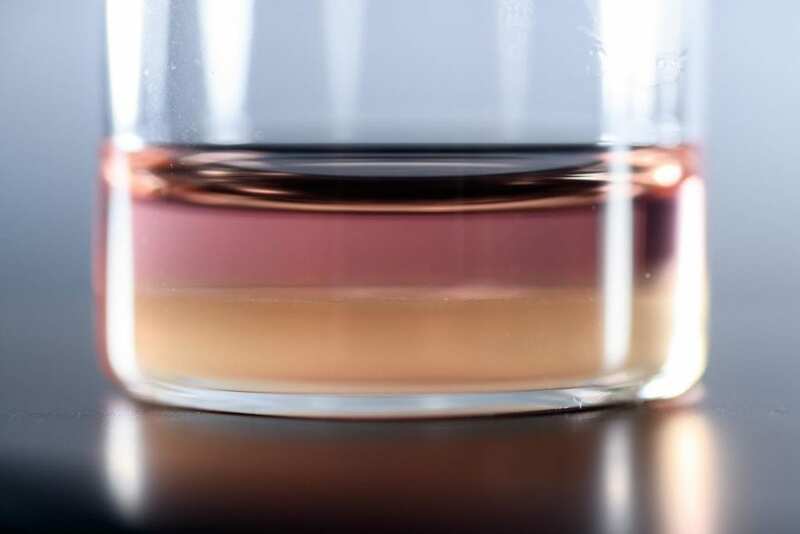 It landed in the second layer and interfaced with the horseradish peroxidase in the core layer, which catalyzed it in the core layer along with that compound that turns colors. "This type of cascading reaction is what one would expect to see membraneless organelles perform," Takayama said. "When researchers think about membraneless organelles, we often think that the reactions inside them are more efficient when their enzymes and substrates are in the same compartment," Takayama said. "But in our experiments, that actually slowed the reaction down. We said, 'Whoa, what's going on here?'" "When the substrate is in the same place where the product of the reaction also builds up, the enzyme sometimes gets confused, and that can impede the reaction," said Kojima, who is a postdoctoral researcher in Takayama's lab. "I was pretty surprised to see it." "It was a Goldilocks regime, not too much contact between substrate and enzyme, not too little, just right," Takayama said. "Sometimes, in a cell, a substrate is not abundant and may need to be concentrated in its own little compartment and then brought into contact with the enzyme," Takayama said. "By contrast, some substrates can be very abundant in the nucleus, and it might be important to partition them off from enzymes to get just enough contact for the right kind of reaction." The research was funded by the National Institutes of Health's National Institute of General Medical Science (grant R01 GM12351) and by the National Science Foundation (grant CBET 0939511). Findings, opinions, and conclusions are those of the authors and not necessarily of the NIH.